[shaking head] I know—I know. Tough times, we're living in. Tough. Times. Eleanor R., we wish you the best in providing for your kittehs—I'm sure everything will work out OK.
What a fuzzy basket of goodness! OMG! It's my orange kitty's long lost twin! Hee hee hee! Smushed cuddly kitties are teh best evar! 'Specially when they give you the ol' one-eye-open look. Aww, so cuddly! Think they can fit me in there....? I love the big ol' orange paw plopped on a little gray head. Looks like a perfect fit to me! ;) Warm, comfy, cozy. heh heh. 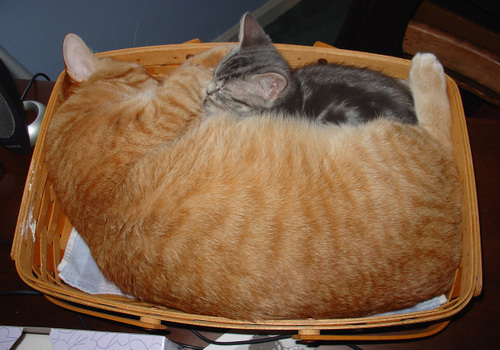 my kitties love to do this too, I bought two beds that fit one kitteh each, and they love to squish together into one. SO sweet! I NEVER get tired of kitty cuddling, as you can see on my blog. And baskets are like boxes for kittehs. They'll squeeze themselves into any size, the smaller the better! hee! I don't think there can be any doubt as to where this particular handbasket is going. Oh my goodness. It's Garfield and Nermal! Also, it's totally adorable. omg, that is *freakin* adorable! Biiiig orange kitteh and teeny gray kitteh! OMG -- it's a snorgle-fest waiting to happen. I bet they smell like warm, clean kitty fur. And for the cost of a cup of coffee, you can help these poor basketless cats. Just a few pennies a day, you can sponsor a basket for a kitteh in your area. Should someone send an extra bukkit? But at least the orange Mama (?) is well fed, even if they have to squeeze into one basket! 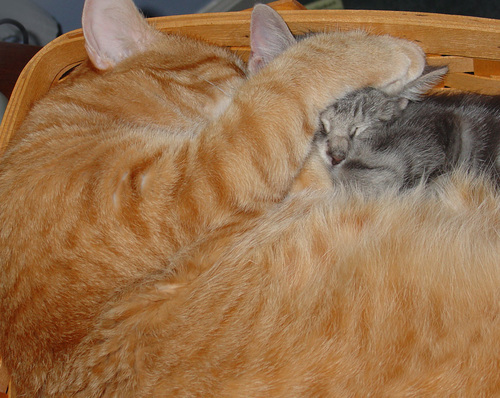 I hope all this cuddling in one basket won't stunt little grey kitteh's growth. Well, at least it is a NICE basket. :::wink::: Looks like a Longeberger. A-tisket, a-tasket, two kittehs in a basket. You cute overload commenters are soooooo funny. I'm sure if we all chipped in we could buy them a bigger basket but I doubt they would use it. They like Snorgling. It can't be Garfield and Nermal -- orange kitteh is too happy! I want to gnaw on the kittehs. Hey! who turned on the lights. We were busy taking a nap here. Hummph! Just ignore them little kitty and lets go back to Slezzzzzzz. It is Garfield and Nermal, only after a good catnip roll. Annie, It does look that way. They were purrfectly happy until someone nosy turned on the lights. Looks like the work of a sneaky mouse. 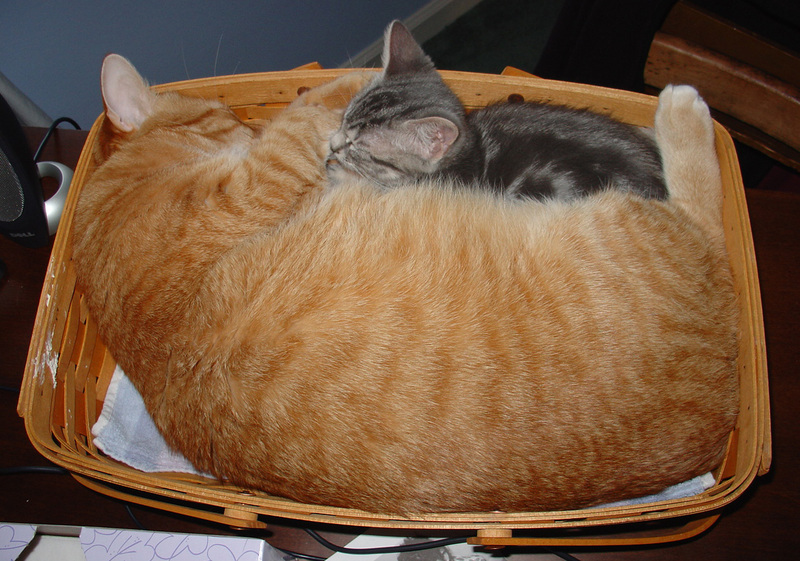 Times can't be too tough if they're sleeping in a Longaberger basket! Those things aren't cheap! Probably why they have to share one between the two. Looks like a mama and bebeh to me. Maybe she hasn't lost her "pregnancy weight" quite yet. I would love to bury my face into their tummies. I used to have two (grown) kittehs.. my coworker gave me one cat bed she couldn't use.. and thereby we commenced what I called "cat bed wars" at my house. Both claimed the bed and neither would willingly yield. So of course many times they'd both be in there. It was hilarious. With your donation of just one cupcake a day we can afford to give each kitteh a more spacious basket. Won't you help? Teh huge basket of orange floofy goodness is de-loosh-ous!! Mmm...snorgle tasty orange kitteh bell-eh. (Hazel) We've got a ginger miss at our house so it could be a mamma, they're rare but are out there. Summer is our 2nd & she's a cuddler like this one seems to be. These pics r bright and beautiful. Love the contrast of the orange & silver/grey. Very vibrant. WOW! They are truly snorglelicious. And I agree, when gray kitteh grows up, they'll still squish themselves together in there. Oh that's Garfield and Nermal all right...after Garfield raided Jon's picnic basket...the only thing missing is Odie and Pooky! cats prefer to smoosh together they hate having to much room to move . the smaller the box, basket, whatever the more kittehs you will find. Perhaps they are looking for an "Extreme Basket Makeover"! Somebody call Ty Pennington and his crew! Actually, they look pretty comfy to me..I wish I was that comfy right now! Don't look, it will only make me depressed? NAH! As soon as I saw the first two photos, I went "AWWWWW", then when I saw the "depressed" comment I thought "Nope, depressed is the LAST thing these photos would make me -- they're ADORABLE!" (And yes, I know the "depressed" comment was meant in jest, lol). Then when I scrolled down and saw the third photo, I literally snorted, from the cute. Now my throat is a bit scratchy, but it is soooooo worth it! :-) Very sweet kittehs! I don't think it's possible for a kitty to be too squished? This is kitty bliss. 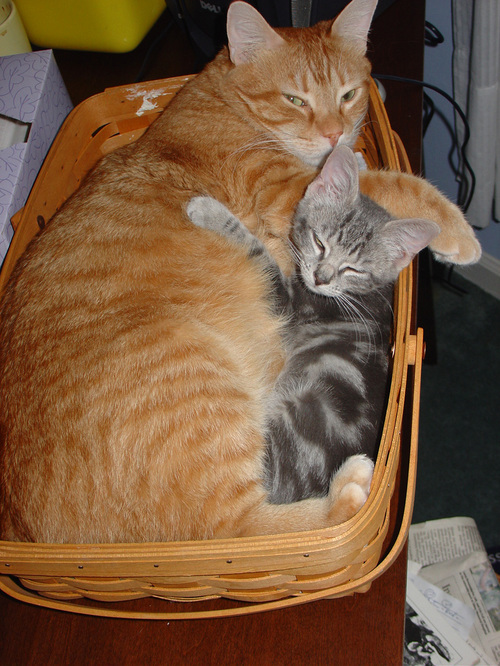 Two best colours of kitty EVER, in one basket for your snorgling pleasure. Too bad it's only virtual. What's depressing is how fat that orange cat is. Stop overfeeding it!!! Oh shush now. That is NOT a fat cat. eesa big soft Marmie, everting be awwwwrite now.